NOTE: This guide is provided as a courtesy and may not reflect the most recent version of Wordpress. 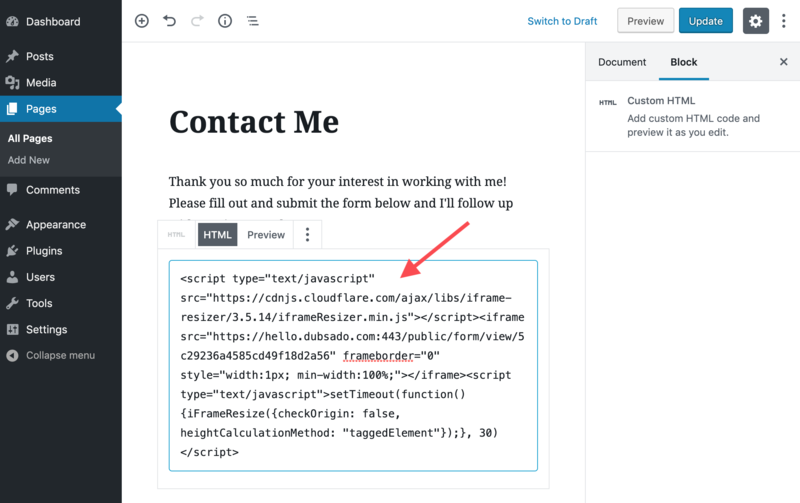 Certain Wordpress plugins may interfere with embedding a Lead Capture form. Dubsado does not offer support related to your Wordpress website beyond this article. 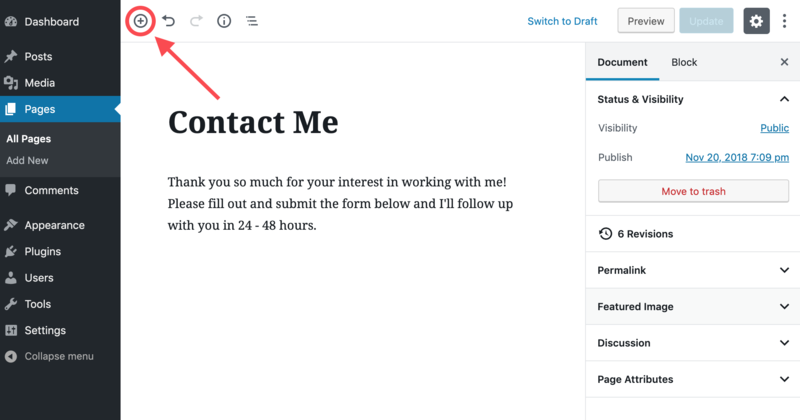 This article contains instructions on how to embed your Lead Capture form on Wordpress using the new Gutenberg editor as well as how to embed the form if you're using the Classic Editor Plugin. Open the Page or Post where you would like to embed your form and click on the Add Block icon in the upper left corner. We will be using the Custom HTML block, which can be found under the Formatting category. Click on this block to add it to your Page or Post. You can now Update or Publish your Page/Post and the Lead Capture form will appear! 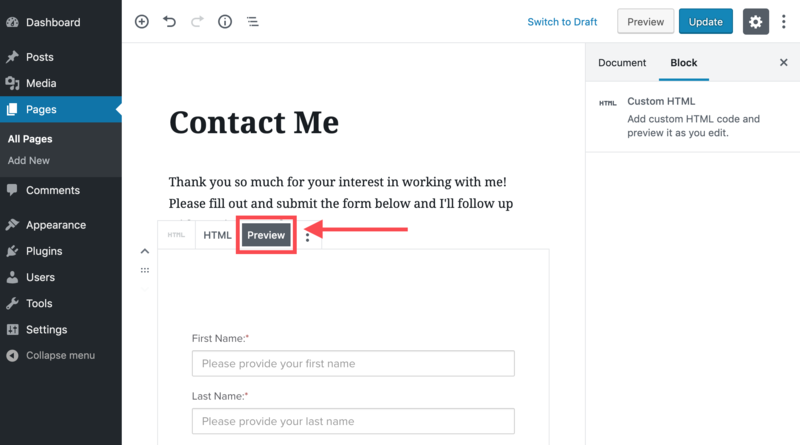 You may want to add a Code Block to the Lead Capture form to adjust margins and padding. You can also toggle the Preview option on the HTML block if you'd like to see the form while in edit mode. If you have not yet adopted the new Gutenberg editor on your Wordpress site and are using the Classic Editor plugin, you can follow these steps! Open the Page or Post where you'd like to embed your form. Toggle the editor view to Text mode. 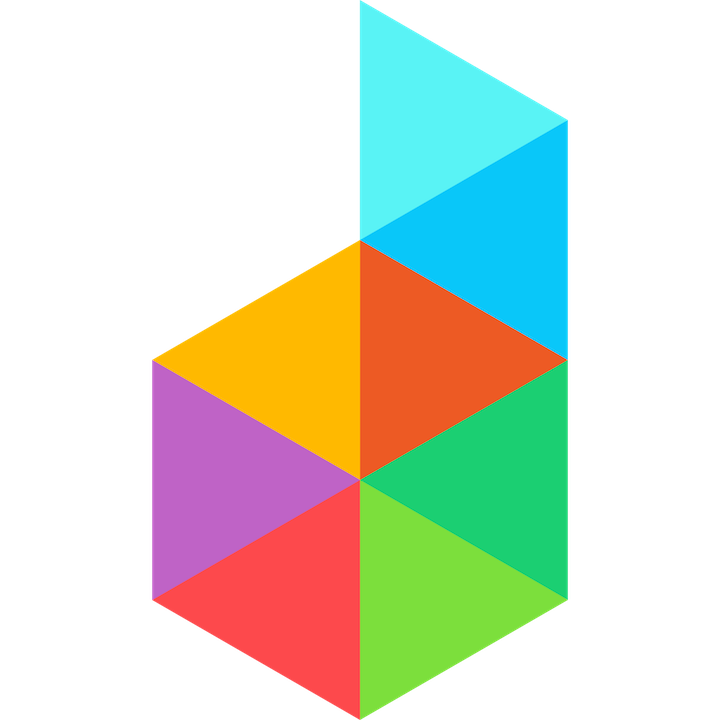 Paste in your iframe Code and Update or Publish. If you toggle back to the Visual editor mode, you may see that your entire form does not appear. This is just a preview and you will see the entire form when you view your live page. Do you integrate with Contact Form 7/Gravity Forms/WPForms? No, Dubsado does not integrate with any Wordpress plugin or theme. If you use a form other than a Dubsado Lead Capture, your leads will not automatically be brought into Dubsado. I use [specific theme/plugin] and the Lead Capture isn't working. Some Wordpress plugins and themes may interfere with the Lead Capture form. Unfortunately, Dubsado is not able to assist you in troubleshooting your Wordpress website or address plugin compatibility issues. We recommend disabling all plugins, loading a default theme, and turning them back on one-by-one to find which one may be causing the issue. The Lead Capture form is getting cut off/has a scroll bar. How can I make the entire form appear? This is likely because the area where you embedded your form does not have enough vertical space. You can follow the steps in this article to force a minimum height on the embedded iframe.